to allowing the user to access global settings or actions (such as the Settings menu in the Contoso Flowers sample bot, or the controls for the Alarm Bot sample). If you need to do any of the above, or to just in general provide a way to converse outside the current dialog, Scorables might be your answer. The set of all Scorables that have been registered to the Autofac container are run in a loop as part of the initial, internal processing of messages, and prior to the receipt of the message by any active dialogs. The code snippets below were all written in C#, and validated against Bot Framework 3.8.0. First, you will want to make sure that your user messages are being delivered to your bot in a way that allows the built-in Bot Framework response logic to be applied, which will recruit your Scorables automatically. If you don’t have an existing solution working with Bot Framework, the following steps will assume you’ve set up the .NET Quickstart Bot. 1. Create a root/default dialog for demonstration. We’ll call this dialog as our root in order to make sure that we have a stable reference. Once it’s been created, it should persist for the lifetime of the conversation. 2. Locate your default or root dialog, and add the Conversation.SendAsync call. This should replace the body of the MessagesController created as part of the Quickstart bot / Bot Application template, depending on how you’ve set up your project. This resolves a new copy of our SimpleDialog, and adds the incoming activity to the existing dialog stack, or to the new copy of our SimpleDialog if this is a new conversation. 3. Create a Scorable to intercept a “Hello” message. public HelloScorable(IBotToUser botToUser) // Make sure the IBotToUser object has been added so we can respond to the user asynchronously! This will scan the incoming messages for “Hello”, and provide a TRUE state if found. This will indicate that the Scorable has a score (“HasScore”) of 1.0 (“GetScore”), and if it’s the highest value Scorable out of the set of Scorables with scores, it will receive the PostAsync action instead of the active dialog. Note that the second type parameter is set to a bool, and all of the “state” items are of type bool. This is because this sample uses the ScorableBase abstract class, rather than the IScorable interface. Since the State is now a typed generic parameter, we can ensure that we’re passing around a consistent item without worrying about typecasts like in the base IScorable interface, which treats all of the comparable fields as a vague object-type. Run the following commands in the Package Manager Console to make sure that all of the features you might need are available. Then add the following code to Global.asax.cs in order to register your custom objects in Autofac. If you’ve got Modules set up, or an existing AutofacConfig.cs, you can convert the code to fit those as well. Now, assuming everything is configured, you should be able to run your bot. 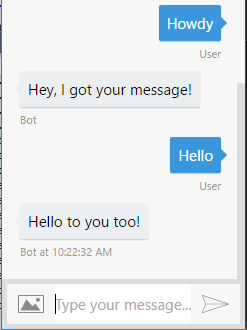 Try talking to it with the Bot Framework Emulator and see how it responds to “Hello” and other messages to test your message interception! As you can see, the Scorables provide a powerful global intermediate layer between incoming messages and your dialogs and forms, and really shows how powerful some of the Bot Framework features are. For more information, please feel free to comment below, or to visit the ever-expanding Bot Framework documentation on this and other topics! To learn more about Chatbots and how Tallan can help you automate business processes while maximizing customer engagement with Chatbot Technology, CLICK HERE. but I don’t want to return to the RootDialog and stay in the same Dialog that is currently processing the user’s message by breaking out of the current conversation. So I would like to know how I can clear all the Dialog stack and add the dialog that was processing the user’s input to the stack and also do the same thing but without clearing the dialog stack. Depending on your use case, you could consider using IDialogStack.InterruptAsync(…) to start a new dialog with a given input. This would allow you to return to your original dialog stack once your new dialog finishes, while also passing some information to that dialog so that it can respond immediately to what you’ve intercepted. And if you need to start a dialog after calling the dialogTask.Reset() method, you should be able to use dialogTask.Call(…) with the dialog you’d like to start, followed by an await dialogTask.PollAsync(default(CancellationToken)); to recheck for “work” in the dialog stack.